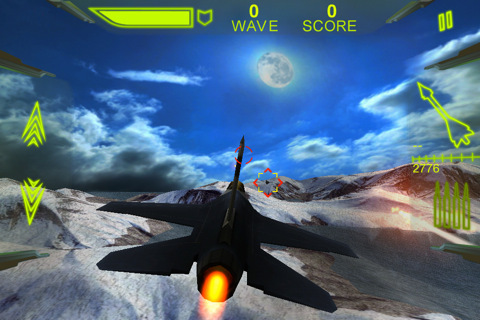 Paramount Pictures impressed audiences with Top Gun, a thrilling flight game inspired by the classic Tom Cruise film. 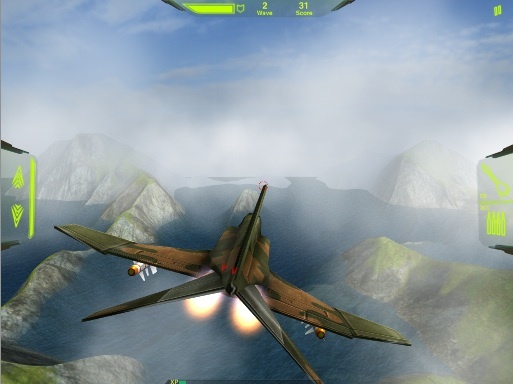 Now Z2Live hopes to wow players with the free to play MetalStorm: Online, an iPhone and iPad title that puts users in the cockpit of high-powered and expensive looking fighter planes. Obviously, the developers didn't release the App free of charge to be nice. Although you can enjoy the game without spending a dime, that means using the standard issue plane, cannon and missiles. To acquire the good stuff, you'll need to grind it out over the course of several days (perhaps weeks), or cough up some real world dough for in-game currency, spending $0.99 for 20 coins, $49.99 for 2500 and various amounts in between. Having the best gear is essentially the difference between life and death. MetalStorm lets you outlast endless waves of computer opponents, which is all well and good, but it also features online play for up to two players. Here, you'll get randomly matched up against another wannabe pilot and engage the other person in a fight to the death, unleashing missiles and a barrage of bullets in the hopes of transforming his or her plane into a burning wreck. It's enjoyable for the most part, largely because of the user-friendly touch controls that let you swipe to perform evasive maneuvers and the virtual buttons that fire the machine gun and missiles. We also dig the accelerometer controls, tilting the iPhone/iPad to command the sky. On top of that, MetalStorm is easy on the eyes, with detailed planes, impressive explosions, vast mountain ranges, the blazing sun and blue oceans. You'll notice said mountains disappearing as the game keeps up with the action, but that doesn't detract from the overall experience, especially when things run so smoothly all of the time, even during online matches. That's but one example at how polished and content rich MetalStorm truly is. The developers packed this App with a ton of stuff, from Game Center/leaderboard support to Facebook and Twitter integration. Then you have the different types of planes (C-101 Annihilator, F-7 Wraith, E-14 Tempest), missiles (AIM-54 Phoenix, MBDA Meteor), cannons (25mm Valkyrie, 30mm Apollo) and plethora of tech upgrades. Bottom line, it's as deep an experience as you want it to be. That said, we wish there was more to do. Battling the computer is a decent way to pass the time, and there appears to be an endless stream of online opponents, but we would've preferred some sort of story mode with different mission objectives, as well as online support for more than two people. The lack of game types is disproportionate to the wealth of planes and unlockable items. Of course, it's tough to argue with free, especially when the game's so technically sound. MetalStorm: Online would benefit from a content update (or three), but it's still one of the better flight games on the App Store. Requirements: Compatible with iPhone 3GS, iPhone 4, iPod Touch (2nd generation), iPod Touch (3rd generation) and iPod Touch (4th generation). Requires iOS 4.1 or later. What's Hot: A wealth of planes/weapons/upgrades, smooth gameplay, online support, Facebook/Twitter, leaderboards, free to download and play, universal. What's Not: Not enough modes, online play is one-on-one only, takes a while to unlock the good stuff unless you pay for it.